Pontoon bridges have been used since time immemorial, and it is said that the original London Bridge was a pontoon bridge built by the Romans. 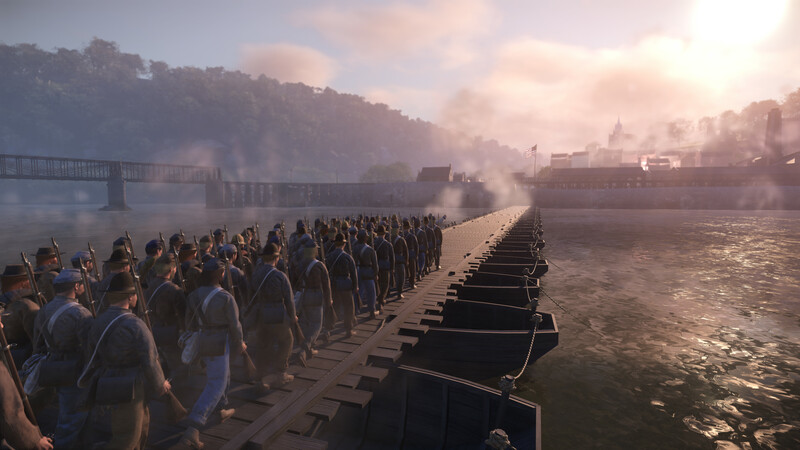 Continuing this tradition, the Union erected a pontoon bridge of their own at the base of the Harper's Ferry Peninsula, using an opening in the Armory grounds' river wall to connect both sides. The fiery Colonel Benjamin "Grimes" Davis convinced the aging General Miles to allow 1,300 cavalry of the besieged Union forces to try and escape using the pontoon bridge through Confederate lines during the night of September 14th. He was successful, taking out or avoiding the Rebel pickets, the lines of which had been thinned due to the exposure of the flank at Crampton's Gap. Davis also managed to use his native Mississippian accent to convince the head of a ninety-one long Confederate ordinance wagon train to take his forces as escorts. It wasn't until morning that the wagon drivers were surprised that their escorts had pistols trained on each one of them! Below is a screenshot of a "what if?" scenario (direct CSA attack on the town itself). 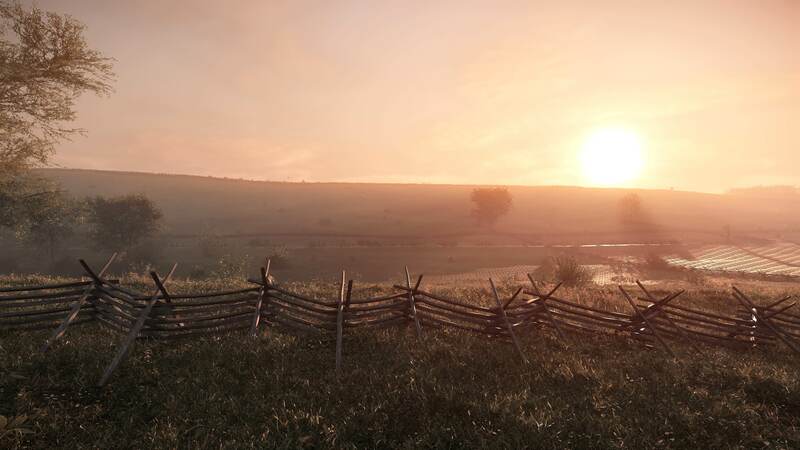 Here's a new Skirmishes trailer for War of Rights! It's been entirely recorded on the live servers and it's featuring some of the many alpha backers of the game. We are now supporting 150 players per server in the alpha. Here's a cinematic video recorded today on one of the drill camp servers by a backer. you guys have truly gone mad. is the netcode pretty good with like 90 players? because not even Battlefield does that, ARMA 3 does all right at 90. pretty sure people would pay for a netcode template in the marketplace or as a standalone plug-in or something, and also for UE4 marketplace. There really was no noticeable difference in server performance from the client's point of view (naturally client fps is affected by a higher numbers of players to render and play animations of) at 150 players than, say, 50 players. This is due to a number of netcode optimizations as well as tweaked interpolation settings. Hello and welcome to the Thirty-Ninth Field Report! Today, we’re happy to announce the release of Update 100 and with it the first release of the next map in line to be made available in War of Rights. As Lee and his army were moving into Maryland, he found that there were several Union positions around him that still had garrisons, most notably the important position of Harper's Ferry. On hearing about the Confederate invasion, General McClellan was refused to pull back the Union garrisons by the General-in-Chief Henry Halleck, which left General Dixon S Miles with a little more than 12,000 men in the town of Harper's Ferry with only the orders to defend it as best he could. To Lee, this town was not only an important strategic position, but the railroads that went through were an important supply line for his army and the invasion. Harper’s Ferry, having been in production since 2014, is only rivaled by Antietam in terms of age and thus we are extremely happy about allowing our alpha backers to set foot in the historic town – center of US arms manufacturing, location of John Brown’s raid (greatly escalating the growing national disagreements into an actual Civil War) and the site of the biggest number of union prisoners of war taken during the war (12,419 Federals surrendered to Jackson). 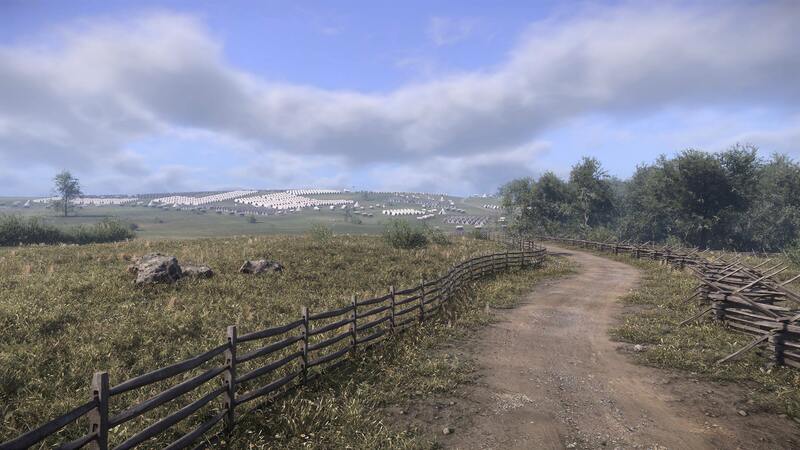 The map will be gradually released covering different skirmish areas like Antietam has been. 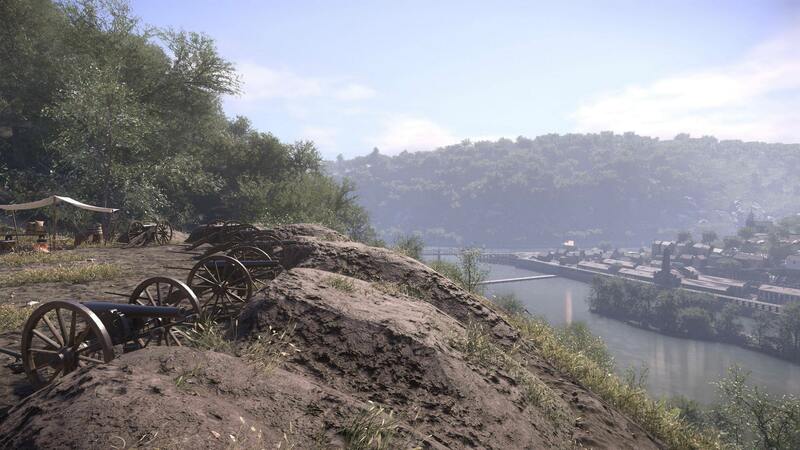 The first skirmish area to be released is titled “River Crossing”. This skirmish area focuses on the Confederates attacking the town by the two bridges (one railroad bridge and one pontoon bridge). 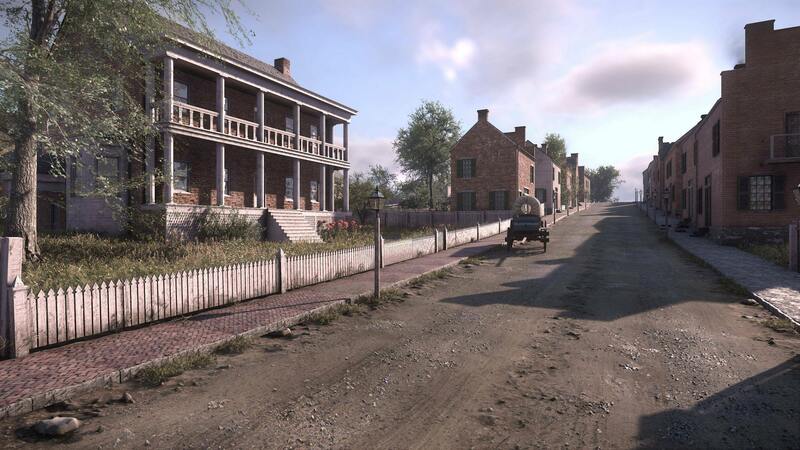 While it never came to direct infantry fighting within the town (the union forces surrendered before the planned confederate assault began) we think these alternative town-fighting scenarios of what could have happened had the Federals not surrendered will provide the players a very different play experience than the rural farms & fields offered by maps such as Antietam. 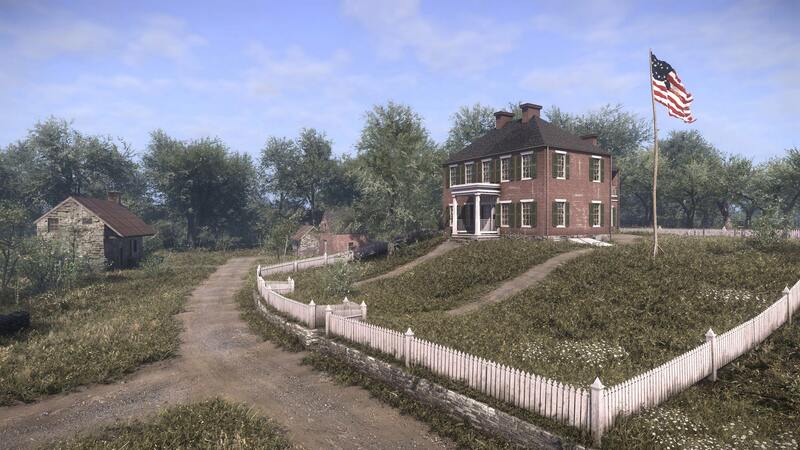 Please note that Harper’s Ferry, as all things in the alpha, is very much a work in progress – expect to see lots of updates to it throughout the development of the game. The update brings more than just Harper’s Ferry – it introduces a new dynamic environment probe solution that we have created to better support our time of day cycle (which has also been heavily updated). Until now, we’ve been limited to a single environment probe in one specific area no matter the time of day. The environment probes capture the visuals of their specific environment (could be a dirt field or a forest for instance) and project the reflections and ambient lighting of that environment onto whatever is inside their affected area. A wheat field specific probe will for instance generally project a more yellow/golden colour (the light cast from the wheat) onto objects than a forest probe would. Before today’s update, all probe textures were captured at noon. This meant that even though you were standing in a wheat field by night, the environment reflecting from you would be that of a wheat field by noon. With our dynamic probe system, we are able to capture the environments every hour and have them dynamically update based on the time of day. This means you standing on a wheat field at 20 past midnight will result in the environment probe projecting the environment captured at midnight instead of noon. 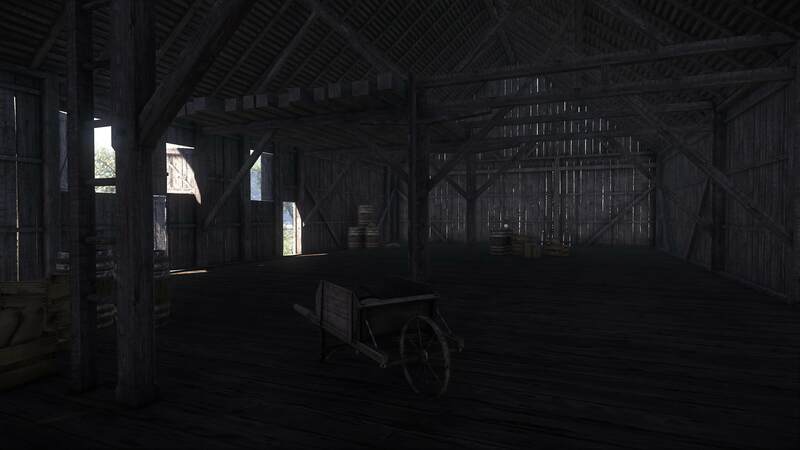 This also allows for much more real world accurate lighting values as the time of day changes so the night ends up not just being dark, but super crazy dark, which then makes the eye adaptation give the scene much more exposure which in the end, results in brighter colors at night seem much more intense, such as campfires, gunshots and artillery explosions. Another side effect of this is that the flash from gunshots at night, is now able to illuminate the smoke that has been building up during the battle, making for some exciting night time battles. If you fire your weapon at night, you will most certainly give your position away. The results of this (please note that this is the very first iteration of the new probe system) means a closer to real life look overall. 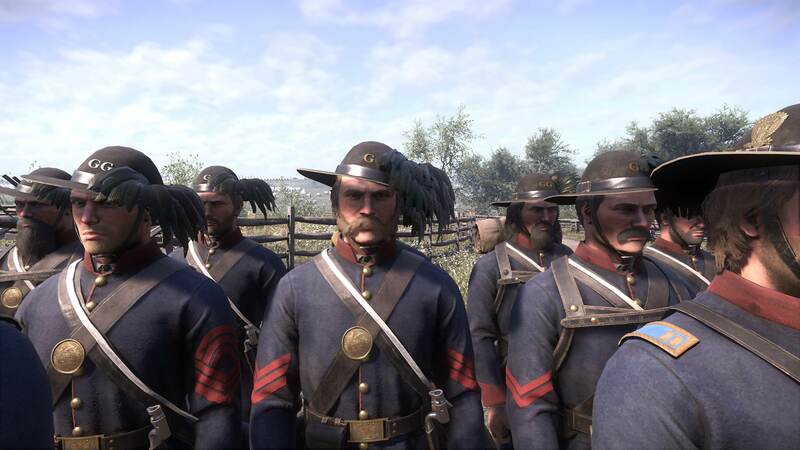 Update 100 contains many other tweaks and fixes such as a more streamlined ready to aim animation, new regiments for to fight in Harper’s Ferry and a lot of code cleanup just to name a few. The full patchnotes can be found here: https://www.warofrightsforum.com/showth ... #post75940. Below is a handful of some of the great videos created by the community these past few weeks. We’d like to thank all content creators out there for spreading the word of WoR! So, when is the next phase of skirmishes and the early access launch? This is a question we’ve been asked once or twice, and we understand the frustration when we answer that we do not know yet. While we still don’t have an ETA for either we are pushing towards both a Phase II and Early Access launch this year. Server & client stability as well as being able to leave a server and join another one are some of the main factors keeping us in skirmishes phase I. 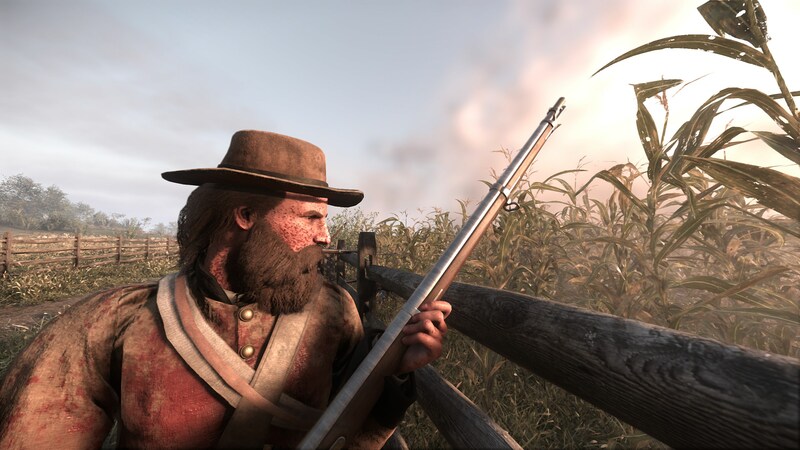 With the introduction of 150 player servers and the formation buff system and with the flag bearer spawning system just around the corner as well as officer specific game rules to limit trigger happy Rambo officer, the main focus of our programming team will short shift entirely to the above-mentioned issues. That’s all for today. We look forward to be seeing you in Harper’s Ferry! Last edited by trustyjam on Tue May 15, 2018 7:24 am, edited 1 time in total. We do use the standard network code indeed - but quite heavily modified now. Our servers are limited to 30 fps but will drop down to roughly half of that when under heavy load. 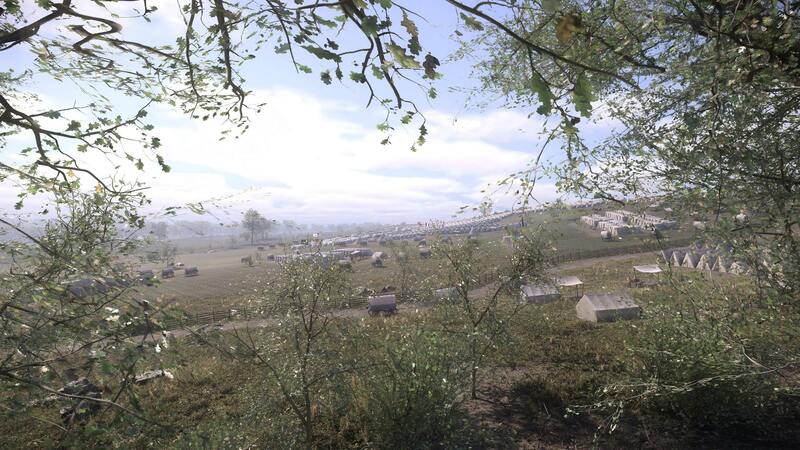 Field Report 40: Skirmishes Phase II Released! Hello and welcome to the Fortieth Field Report! Hello everyone and welcome back to our field report news segment - it’s most certainly been a while since our last one (6 months!) so we’re happy to be kicking things off with some exciting news indeed. 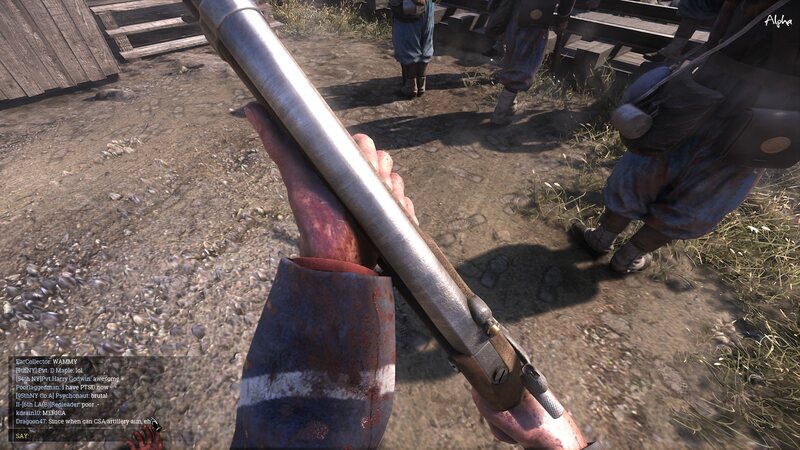 Before we go ahead we’d like to thank all of our backers and followers for allowing us to build War of Rights. This project would not have been possible without the financial support and willingness to alpha test provided by you. Thank you! Lastly we’d like to remind you that the game is currently in its alpha phase and thus any presented features and mechanics are subject to change throughout the development of the game. We’re very pleased to finally be able to release Skirmishes Phase II and thus open up the alpha to all “Sergeant” tiered backers and above! Below is a highlight list of some of the major features Phase II brings to the game. Phase II is a major milestone for us as it covers the initial introduction of the flag bearer spawn system intended to simulate the reserve of a regiment. 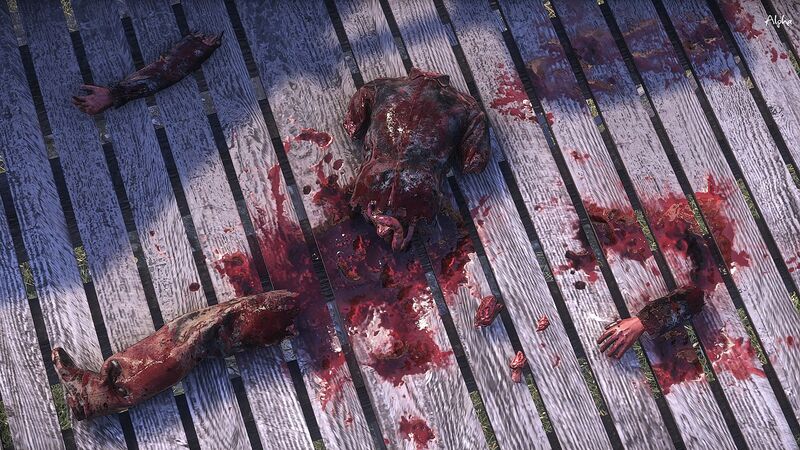 The other highlighted major feature of Phase II is going to be drastically improving the immersion and variation of the environments of the game - we hope you remembered to pack that gum blanket, soldier! This first version of the flag bearer spawn system has been a long time coming. We’ve had to rewrite the spawn system of the game as well as create a system to calculate where to allow for players to spawn (it’s no good to spawn inside a rock, under the ground, etc). The flag bearer spawning system provides players with another option to the default base spawn wave one that has been present in Skirmishes since day 1. Now, players can opt to spawn on the flag bearer provided his formation buff stance is not “Out of Line”. Once selected, players will be placed in a spawn queue and spawned on the flag bearer when they have reached the end of the queue. The flag bearer is designed to be a slow trickle of reinforcements and not act like a mobile base that spawns in countless of players on each spawn wave and thus the time to spawn on the flag bearer will vary wildly depending on how many other players are wanting to spawn on the flag. Should the flag bearer be killed it is no longer possible to spawn on the flag we’ll make it so other players can pick up the flag and thus becomes the new flag bearer in a future update. Should no player pick up the flag it will eventually timeout and the flag bearer class option will be available to select on the class selection screen once again. This is a project we’ve been steadily working on, on the sideline for the last few months. You will be experiencing clear skies, cloudy skies and when it rains, it can be all sorts of degrees of rain, light, medium, heavy and everything in between. When it stops raining, the ground and objects, including characters will remain wet sometime after. The wet ground will produce wet and sticky footstep sounds. It also features lightning strikes and dynamic wind, making the vegetation sway more violently and pushing gun smoke off the battlefield more quickly. During skirmish playtime, the weather can only get so bad as no general (or at least very few) in their right mind would order an attack in heavy downpour. The past six months have been very busy for us indeed. We have released 22 alpha updates as well as numerous hot fixes in this timeframe. 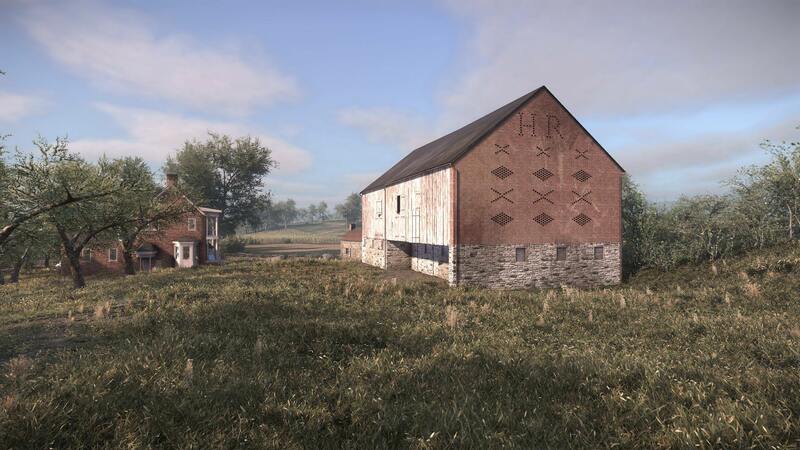 Being so long since our last field report, we thought it best to give you all a list of highlights of some of the changes, fixes and additions these months have brought War of Rights. Due to the project having entered Skirmishes Phase II now and nearing its Steam Early Access launch (more on that below), we are going to be changing the pledge tier availability in our long-lasting crowdfunding campaign starting from today. The discounted “Private”, “Musician”, “Journalist” and “Corporal” pledge tiers have been discontinued as part of our move to ultimately shutting down the crowdfunding campaign when we launch on Steam Early Access. 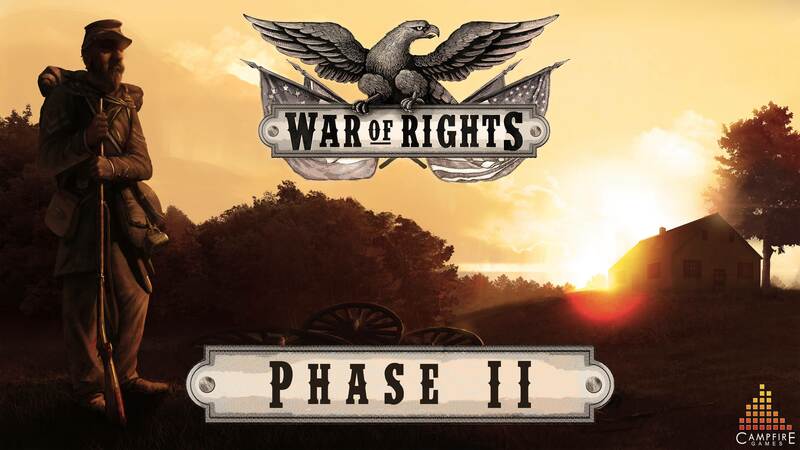 If you want to raise your pledge (can be done by following this link and the steps located there: https://warofrights.com/Crowdfunding_RequestLogin ) in order to secure yourself additional exclusive physical or digital backer rewards now is the time to do so as the crowdfunding campaign in its entirety is indeed drawing towards its end. With Skirmishes Phase II now released our sights are set on the next major milestone, the launch on Steam Early Access. It is our intention to launch there before the end of the year but naturally delays could happen. Between now and then is a whole lot of polish, bug, crash fixing and expanding the flag bearer spawn system as well as add in end game events designed to make the final moments of the skirmish areas more memorable. The above will be our main focus going forward. We look forward to be seeing the many new faces taking part in testing out Phase II and we’re sure the veteran players and companies will do their utmost to give the green recruits a warm welcome. We launched on Steam Early Access back in December so we've been super busy fixing up stuff, adding more content, admin commands, anti troll systems, etc. etc. but I thought I'd just drop a few videos created around the time of our launch. I've also updated the original post to roughly match our Steam store page.